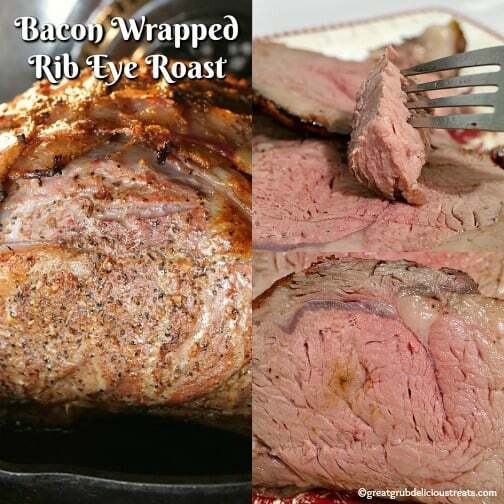 This bacon wrapped rib eye roast is perfect for the holidays. The crunchiness of the bacon, mixed with the juices and the flavor of the meat, is AMAZING! 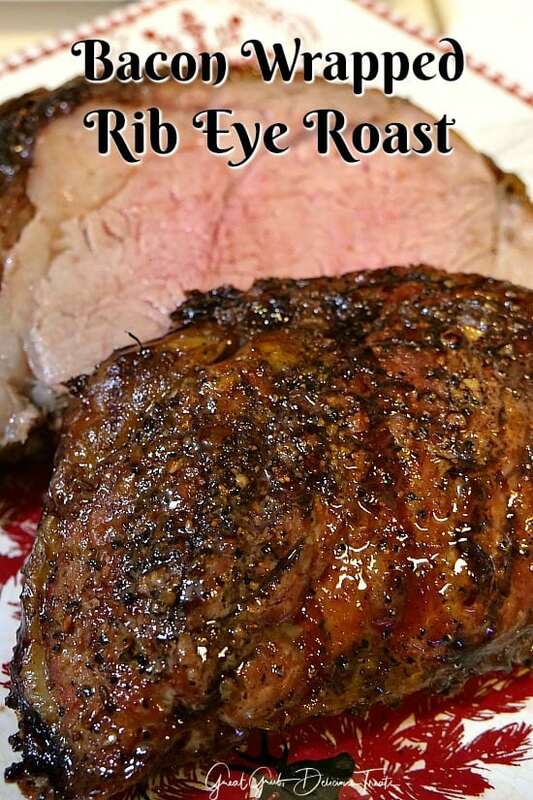 Seriously, this is such a great tasting roast that will surely please and perfect for Christmas Dinner. I have to share a story with you all and it’s about the wonderful butcher at our local grocery store. I was in the soda aisle and a man asked if I was finding everything okay. First off, totally surprised because nowadays, no one just comes up and asks if we need help or are finding everything okay. I said yes and he went about his business. When I arrived to the meat department, there was that nice man behind the counter. Another young man was helping me and I picked out my roast, he weighed it and wrapped it up. The nice man, Aaron, asked if I wanted him to cut the bones off and wrap it like he does his rib eye every year. I said, “sure” and then Aaron unwrapped the roast, cut the bones off, seasoned the whole roast, tied the bones back on, and then proceeded to make the bacon blanket. What an amazing employee! He didn’t have to go the extra mile but he did. He totally provided excellent customer service probably without even realizing it because that’s how he is everyday! I did call the store’s headquarters and let them know just how wonderful this employee was. The nice lady told me that this employee will be recognized for his excellent customer service. So this is how you make the bacon blanket. 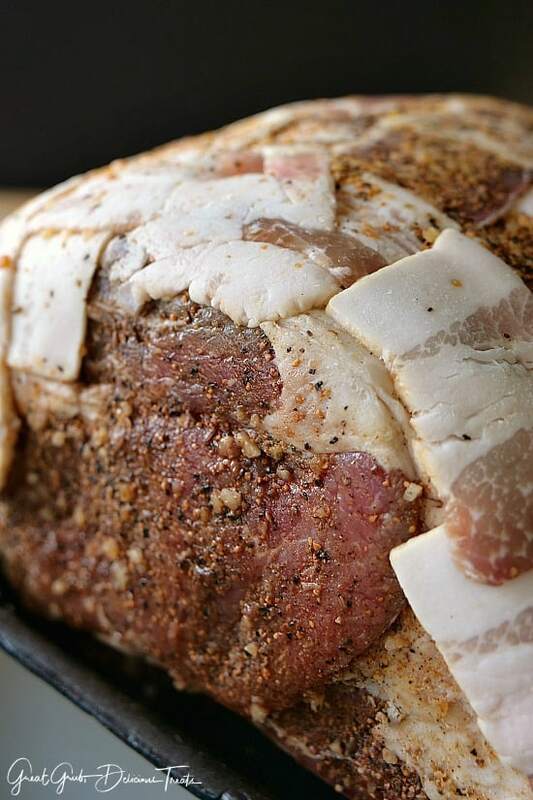 Lay about 4 slices of bacon across the top of the roast, then add the same number of slices going the opposite direction. Weave each slice of bacon like the photo above. Weave in additional slices to completely cover the top and sides leaving the outer edges uncovered. Sprinkle seasoning on top of bacon as well as over the whole roast. The bacon helps hold in the seasoning during cooking. 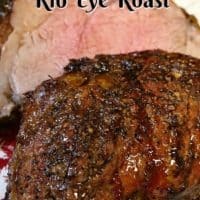 To get this wonderful bacon wrapped rib eye roast started, place a large cast iron skillet into the oven and preheat to 475 degrees. 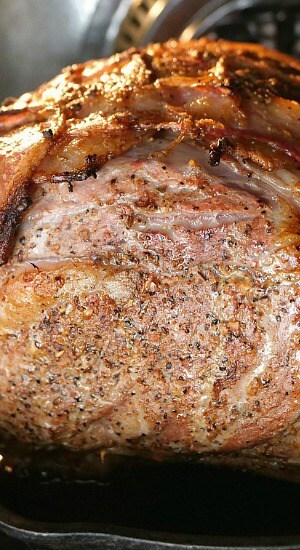 Once the oven has reached 475° carefully remove the skillet and place the roast in the skillet, bacon side up. Put back into the oven and cook uncovered for 30 minutes then lower the temperature to 325° and cook for 2 hours. 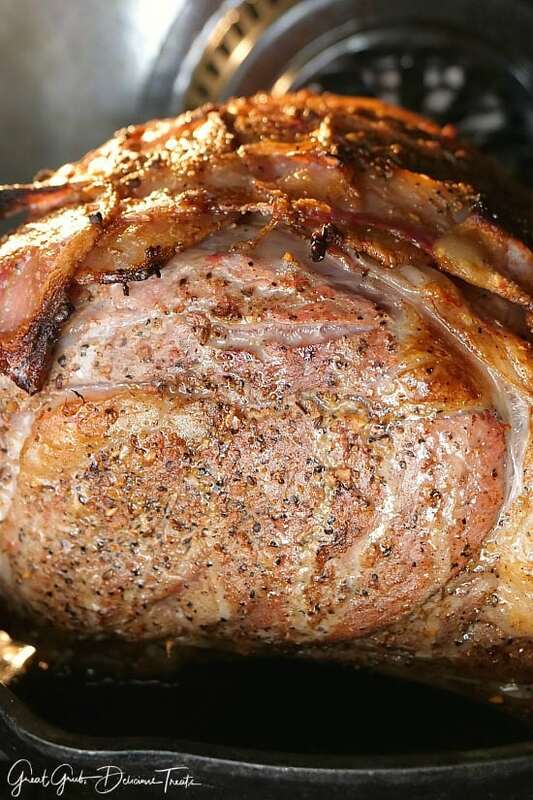 Next, turn off the oven and let the roast sit in the oven for 1 1/2 hours. DO NOT open the oven door. 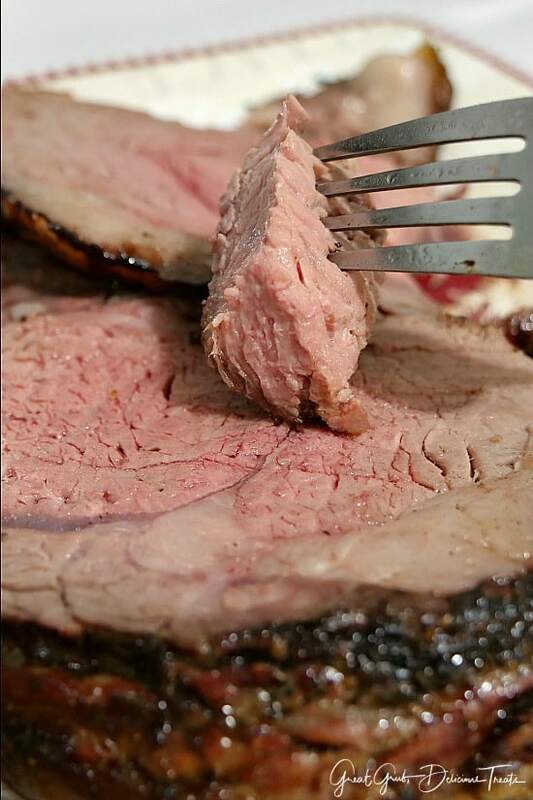 After the hour and a half, turn the oven back on to 325° and continue cooking for 1 more additional hour or until the internal temperature of 130°-135° for medium rare, 140°-145° for medium, 150°-155° for medium well is reached. 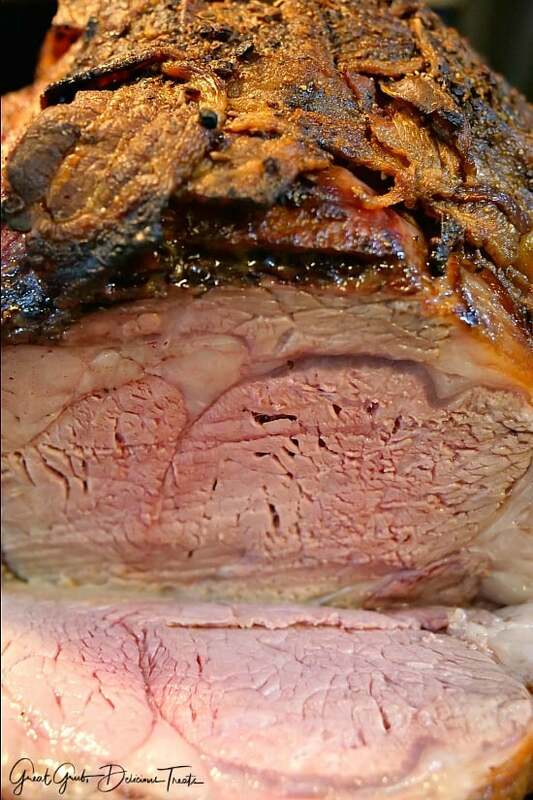 When the roast has finished cooking, let it sit and rest for about 15-20 mintues before slicing. Here are a few more delicious beef recipes you can find on the blog: Crock Pot Chuck Roast with Mashed Potatoes, Chuck Roast Spicy Chili, Classic Lasagna, and Bow Tie Pasta Lasagna, plus many more. Place a large cast iron skillet in the oven and preheat to 475°. Cut bones from the roast, season all sides of the roast along with the top and then place bone section back onto the roast. Tie bones back in place using cooking twine. Next, start making the bacon blanket by laying a few pieces of bacon across the top of the roast. Then add a few pieces of bacon on top in the other direction. 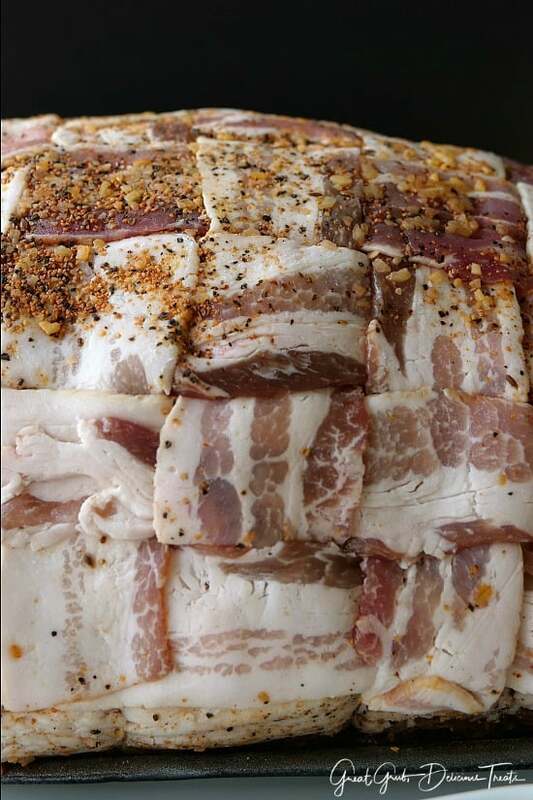 Start weaving each piece of bacon under and over to make a bacon blanket. Add additional bacon until the entire top is covered in bacon that has been weaved together. Carefully remove skillet from the oven once 475° has been reached and place roast into skillet, bacon side up, and carefully place back in the oven. Do not cover. Cook for 30 minutes on 475° then lower the temperature to 325° and cook for 2 hours. 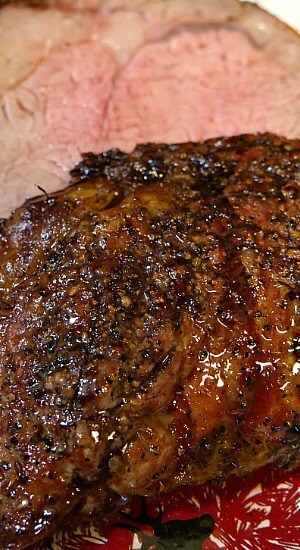 Turn oven off but leave roast sit in the oven for 1½ hours. Do NOT open the oven door. After an hour and a half, turn oven back on to 325° and continue cooking for 1 more hour or until with internal temperature of 130°-135° for medium rare, 140°-145° for medium, 150°-155° for medium well is reached. Remove from oven, let rest for about 15-20 minutes then enjoy!